Royal Panda is an established online casino that’s been taking on the biggest online casinos around since launch. Has it succeeded? It sure has. Join Royal Panda and enjoy original promotions, fantastic games, progressive jackpots worth millions and outstanding customer service. And in terms of design, there isn’t an online casino that can measure up to Royal Panda. Royal Panda is fully licensed to offer online games of chance within the European Union. 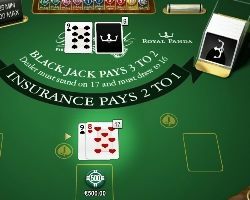 The Lotteries and Gaming Authority of Malta has awarded various licenses to Royal Panda, which includes a license permitting it to offer live casino games. These are without a doubt the best live games you’ll have ever played, but more on that later. Delivering a website that is simple to use for veteran and novice players alike was an important point throughout the development of the Royal Panda website. Speed, ease of use and transparency are the points that best describe the experience of playing at Royal Panda. Use the hot and cold slots function to find those slots that haven’t paid out in a while. Unique promotions: Royal Panda launched with a major international campaign to win a space trip. Loyal Panda: Royal Panda operates a unique loyalty program whose aim is to reward loyal players for their loyalty. Play at Royal Panda and earn Loyal Panda Points (LP Points). Loyal Panda Points can be exchanged for tablets, smart phones or Royal Panda merchandise. With more than 200 casino games, there’s plenty of choice at Royal Panda. New games are launched every month. Alongside blockbusters such as the South Park and Scarface slots, table games such as the Professional Series editions of blackjack and roulette come as highly recommended. One nice option is Royal Panda’s exclusive hot and cold slots function. Find those slot that are on the verge of paying out, or those slots that haven’t paid out in ages. Table games: all the classic are available. The best games are without a doubt those from the Professional Series: blackjack, roulette, baccarat and TXS hold’em. Poker: Various poker games are available, where you play against the bank: play trey poker, red dog and more. Video poker: Play jacks or better, deuces wild or all American and win with up to 100 hands. Jackpot games: More than €7.5 million in jackpots await. What more is there to say? Slot machines: more than 200 video, jackpot and classic slots in total. Live casino: the best Indian live casino in, featuring live roulette and blackjack. The English-language customer support is truly second to none. You won’t find a better customer service anywhere else. Super-quick responses and extremely dedicated staff are what sets it apart. Alongside credit cards, Royal Panda offers numerous other secure payment methods. Want to pay by Neteller, Ukash or Skrill instead? Not a problem. In total there are more than 15(!) payment methods available. That the lowest withdrawable amount at Royal Panda is $10 is definitely worth a mention as well. The minimum amount that can be deposited is also $10. We can’t find any. Can you? Conclusion: Without a shadow of doubt, the best online casino at the present time. We’re expecting much more to come from Royal Panda in the years ahead.